I started reading the Betsy Devonshire a couple years ago at Christmas time with Crewel Yule and enjoyed it so much I started in on book 1 and went through the series fairly quickly and then stayed caught up. I truly enjoyed the stories except that, as usual in long series, the last couple weren’t quite up to the first ones. So I was looking forward to the new one and then very irritated when the new reader turned out to be such a dud. I procrastinated listening to it but I eventually caved. The usual narrator for the Ferris series is Susan Boyce who is great and I’m used to her. Bronson’s voice for the narrator and the protagonist (most of the book) is fine – the problem is that several of the other characters are stylized to the point of sounding like little cartoon animals. It can become a horrible distraction. But I enjoy Ferris enough to plug on anyway and I think the irritating characters started to blend in better – I became totally involved in the book. Anyway – onward – this series of traditional who-done-its (not quite “cozies”) takes place in a small town outside of Minneapolis where Betsy Devonshire runs a needlecraft shop she inherited from her sister. After investigating her sister’s death in the first book of the series, she goes on to make a success of the business, hire a talented, fun and gay assistant, make a lot of friends including Jill, an ex-police officer, gain a boyfriend named Conner, as well as solve murder mysteries as they come up. But all this took 16 books to develop. 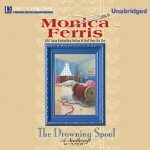 The plot line of The Drowning Pool is excellent – the dead body of a pretty young woman’s is found in the pool of a senior facility near Excelsior, Minnesota. The black janitor is fired because it is thought that he let the unknown murderer into the building. The janitor’s sister is a friend of Betsy’s and that, as usual, is how she gets involved.